Esl exercises - not always just a worksheet! Wonderful nature on our way to Cinnabar Ridge! 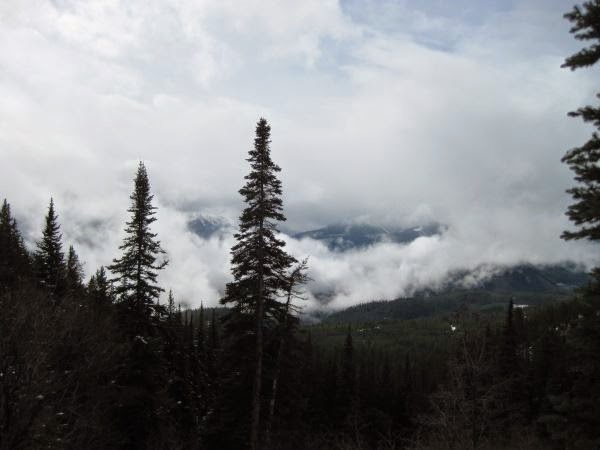 When, Lina, Alina, Diana, Pauline, Kate and I, started our hiking trip on Friday morning, the weather looked ominous with the clouds were hiding the mountain tops and the sun barely shining through. 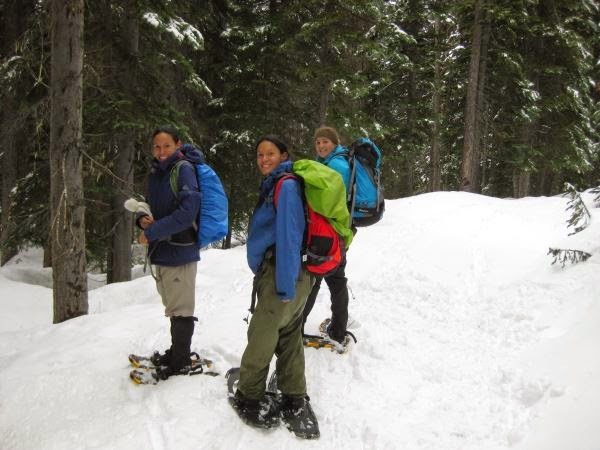 Nevertheless, we put on our rain gear, put the snowshoes in our backpacks and headed out on our mountain adventure. In the beginning it was a little bit hard for me to find my rhythm as I hadn't done anything for my condition the last few months. But it got better every step I took and even it was lightly raining I enjoyed the feeling of being alive and having the connection with nature, carrying out esl exercises outside the classroom! The dogs Malou and Boo were running around us and you could hear the sound of the forest around you and you could feel the peace of nature. I just felt like I was at the right place at the right time. 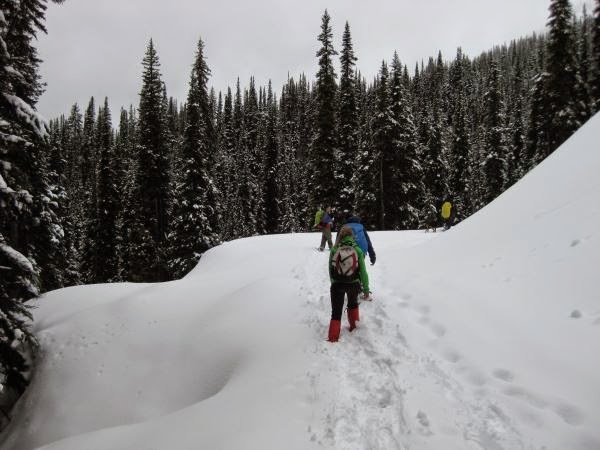 After a while we got into steeper terrain and the what was once dirt covered trails turned quickly into snow covered trails which got deeper and deeper the higher we ascended. It was getting harder to walk in the snow, so we put on our snowshoes. With new power we walked further up and you could here the hard breathing of 5 girls (of course Kate was walking up the hill like it was nothing :)) and the constant “scht” “scht” sound of the snowshoes. When you took a short break you nearly could hear the silence of the snow and nature around you – just freedom and peace. It didn't take long till one of us asked Kate the question we were all thinking about, “Is it still far to go?” Kate said something about 3 more corners and with new motivation we were nearly running up the hill, OK it was more an exhausting pushing yourself to do one step after the other, esl exercises indeed!. The snow got deeper and the job for the front-woman even harder but we pushed each other up the hill. Finally we decided that we reached our goal and we were sitting down to enjoy our well deserved lunch. It was one of the perfect and peaceful moments where you bite in your sandwich after an exhausting trip and you think how amazing your life is. Even though the weather was less than ideal, I enjoyed being in the present moment and not worrying about anything. After a while sitting on the mountain top we started to get cold and decided to descend back to the ranch. The last few steps up to the mountain top! Now the funny part of the trip started. Kate had decided that it is unnecessary to walk all the way down the same track that we came up. Why not shorten the way and take a slide down! We laughed a lot while sliding down the steep snow covered hill and suddenly the exhausting part was forgotten. Still giggling we walked the whole way down while I was sometimes falling on the ground, my clumsiness keeping the others entertained and in a good mood. Finally at half past 4 we arrived back at the Ranch tired, sweaty but satisfied and extremely happy. Proud or our achievement, we all headed of for a well deserved shower. This trip taught me to always keep moving forwards, regardless if you feel exhausted and you think you can't take another step further, just do it – fight for it and you'll be fulfilled with life and satisfaction afterwords. And never turn down an opportunity because you think “the circumstances are bad” (like the weather) – it could prevent you from having an unforgettable adventure in your life!